One of the most fun parts of wedding planning is actually less about the wedding and more about the vacation afterward! According to Wikipedia, traditional honeymoons came from a Biblical background, where in Deuteronomy 24:5, it is said that "When a man is newly wed, he need not go out on a military expedition, nor shall any public duty be imposed on him. He shall be exempt for one year for the sake of his family, to bring joy to the wife he has married.” In more modern times, these post-wedding vacations were started by the elite upper class who traveled with friends and family to visit relatives who were unable to attend the wedding ceremony. These days, many new couples jet off to an exotic or romantic honeymoon destinations to spend some time alone after the wedding whirlwind dies down. So how should you choose where to travel? Here are some tips on planning the perfect honeymoon. Consider how long you want to/can afford to be away. If you only have a few days, don't fill it with travel-- stay a little closer and use that time wisely rather than be stuck on an airplane or in the car. If you check the prices of travel agencies such as Liberty Travel, you may be able to find some great deals. Think about the activities you'd like to do (or not do!) on your trip. Bored on the beach? Explore a new city instead. If you're both active, you may enjoy hiking, white water rafting, or seeing new sights. If you're traveling abroad, check the weather at the time of year you'll be going, and also be sure to check on the exchange rate. >In today's world, unfortunately, it's important to keep up with current events. There is conflict and natural disaster happening as I type this post-- be sure you know the conditions of the place you are visiting. If you need passports, apply for them in advance. This process should take roughly 6-8 weeks, but could take longer. It's smart to have a passport anyway-- if you are even considering leaving the country, go ahead and apply. This tip is one that was given to me and made packing so much easier: Shop ahead of time! You don't want to be scrambling the week before your wedding trying to find something to wear in Hawaii. Once you know where you are going, purchase pieces here and there, as you find them, to make last minute packing stress-free! After spending one week in beautiful, sunny Rome, we have returned with a newfound love of home! Many people say that the best part about vacation is coming home, and I couldn't agree more. We saw all the sites, ate more pasta that anyone should ever eat in a week, and had a ball...but by the last day, nothing sounded better than our own bed and getting back to our two dogs. Overall, the trip was fantastic though and I have nothing but appreciation for Italian culture and the friendly atmosphere in which we were received. Hello from Rome! Sam and I are thoroughly enjoying our Roman honeymoon at the Westin Hotel Excelsior on Via Veneto. We arrived last week after our whirlwind wedding weekend, ready for a week of rest, seeing ancient Rome, and food (mostly ready for the food). Our wedding was such a success, I could not be happier about it. We chose to have the wedding at the Ritz Carlton Grande Lakes, Orlando, because of their picturesque Da Vinci lawn with a great view of the sunset. We took a risk having it in early February, because Florida weather is tricky during this time of year. Luckily, the weather was perfect, the sunset was AMAZING and guests were happy outdoors, especially once the dancing started! 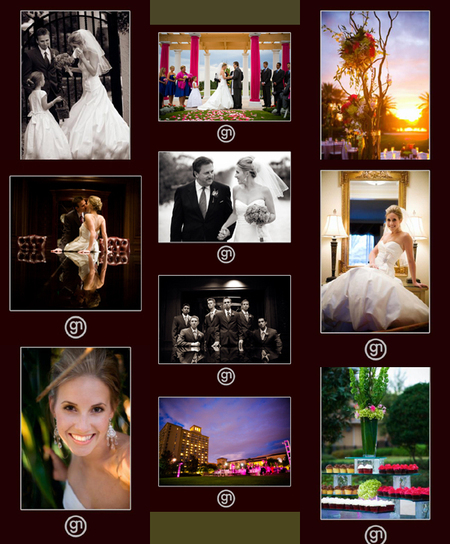 I cannot say enough good things about the Central Florida bridal vendors I worked with on planning the event. Lisa Konecny of E-Events, along with her right-hand-woman, Terri Greene, made the wedding day painless. I literally did not have to think about any set up, vendor payments, or small details on my wedding day because they handled all of it. Simone Rosas of Makeover Station was a gem, getting my bridesmaids and me ready to look our best for the evening. Simone was efficient and imaginative, transforming each of us with looks that suited our styles and personalities. We hired videographer Mark LeGrand of Pro One Video to catch the whole day and night on film. I am really looking forward to seeing the finished product and the expressions of my family and friends. There is way too much going on during a wedding for the bride and groom to see it all, so videography and a great photographer are necessary to recap in the future. We had three excellent musicians during the wedding: my brother, Tristan, played the cello during the ceremony; guitarist Mike Hinckle played the cocktail hour, our first dance and the after-party; The Landsharks Band got every guest on their feet during the reception. We could not have chosen a better trio of talented musicians to make the day special. We return home tomorrow and I cannot wait to spend some time uploading both photos from Rome, as well as some from our wedding by our fabulous photographers, Joy and Garrett Nudd. 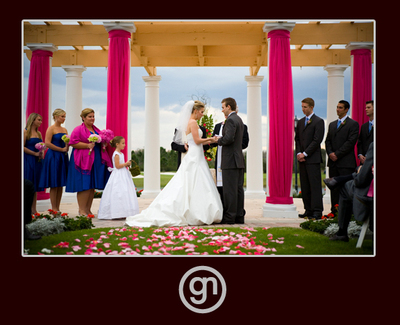 For now, check out a sneak peak of our wedding photos at Garrett's blog.